As you all know, I am a big fan of potatoes and soup, so this could easily be my very favorite food. 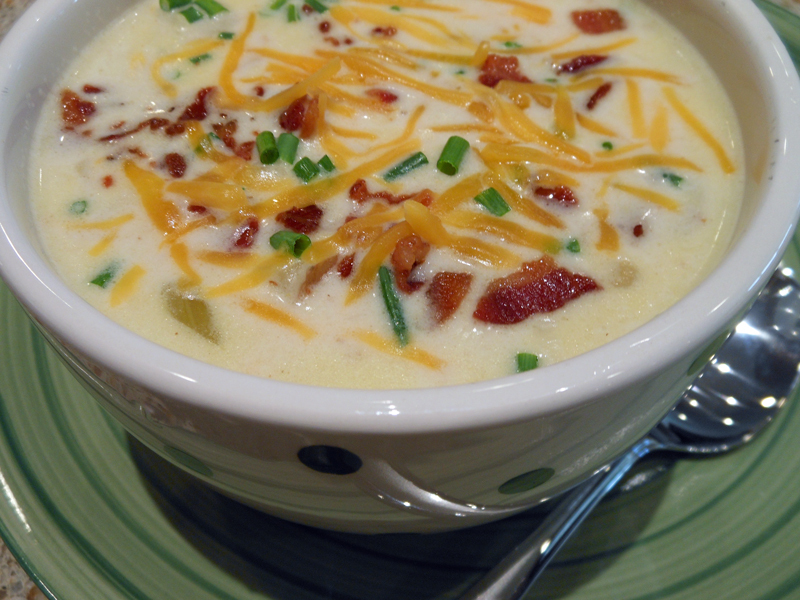 This is the second recipe for baked potato soup that I have added to my blog. Slightly different but equally delicious. Go ahead and interchange them any way you see fit. In my opinion, this is the ultimate comfort food. In a 6 to 8 quart stockpot over medium heat, fry bacon until crisp. Remove bacon and drain on paper towels, reserving half for garnish. In bacon fat, cook onion, carrots and celery until the onions are translucent. Add potatoes and cook for 4 minutes, stirring occasionally. Stir in flour and stir constantly over low heat until the flour is cooked and the mixture has thickened slightly, about 5 to 7 minutes, stirring often. Add chicken broth and half of the bacon. Season with salt and pepper. Over medium heat, bring the soup to a simmer and cook for 30 to 40 minutes or until the potatoes are soft, stirring often. Mash some of the potatoes for thicker, creamier texture, if desired. Add half and half and simmer for 5 minutes. Enjoy with whatever toppings you like.